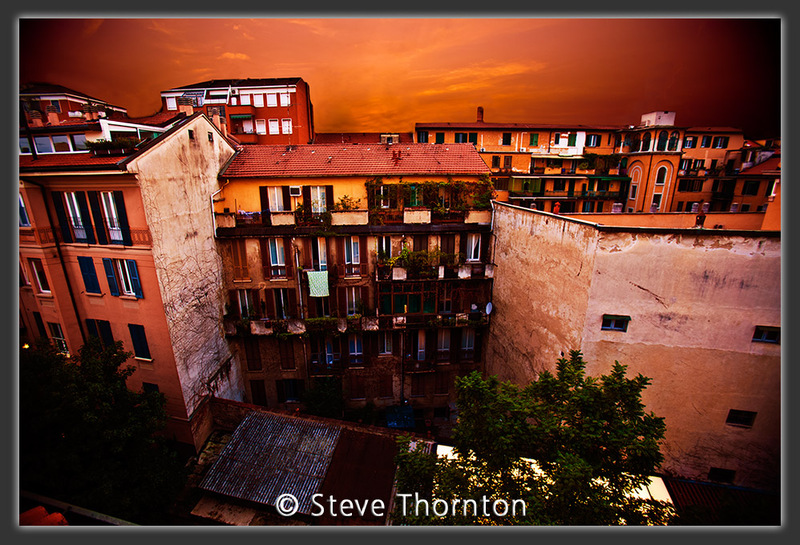 This was shot in Milano from the balcony of the apartment just after sunset. It is a great view but it is also a 5 floor walk up. It is located in the center of Milano about a 10-15 minute walk to Via Monte Napoleone. Gear: Canon 16-35mm f2.8 zoom lens @ 16mm set at f2.8, Canon professional digital camera at 1/100 second 100 ISO and then processed using Photoshop CS4 and using the Adobe RAW converter. If you would like to use this image, or any of my images for mock or comp use, please just ask. There is never a charge for this service. Educational use is permitted without charge, unless published, but please ask first. All commercial use is available only with a limited copyright release prior to use from the copyright holder, Steve Thornton. Thanks for looking!